Green onions are pretty dang inexpensive here in Orange County where we are overflowing in multicultural supermarkets. I know that I can sometimes buy ten bunches for just 99 cents when they go on sale. It's part of the reason why my parents have never added the bulbs to their garden repertoire in the back - why buy something you can get for pennies? Nevertheless, I've always been curious and since I've been cooking at Duc's apartment, it's always nice to have some on hand without having to buy them all the time. 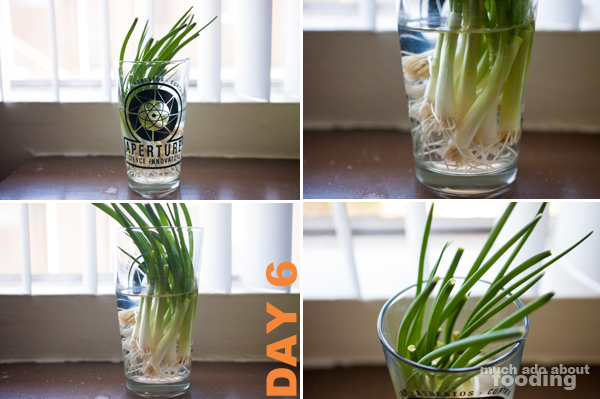 PLUS, we never get through an entire bunch before some start to go bad so re-growing them in water seemed like the perfect DIY to preserve and limit the amount we use. 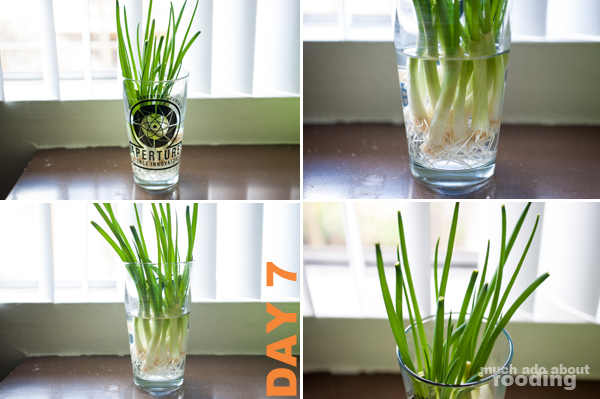 I had read that this works as well as with other vegetables so gave it a shot. The results are documented in the photographs throughout this post! 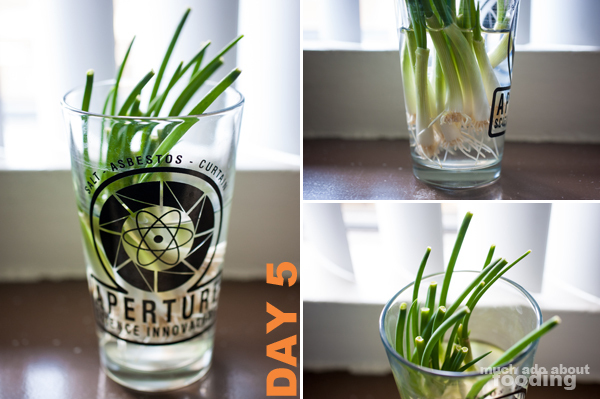 So, grow green onions in water! It makes the most sense for those of us who don't use them too frequently but frequently enough to need some from time to time. 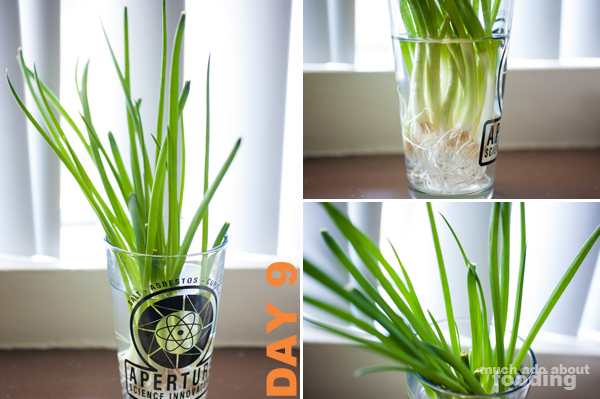 If you are of the camp that enjoys the white bulb parts of the green onions most, this might not be for you because the part that regrows is all green. Nevertheless, maybe you want to give it a shot. My experiment was done for both convenience and FOR SCIENCE! 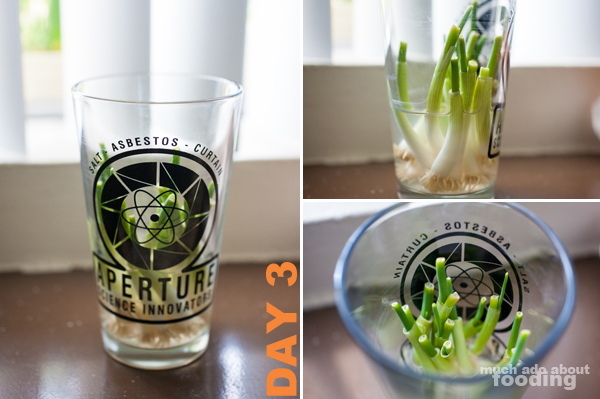 Props to you if you get the reference from the pint glass I grew the onions in! 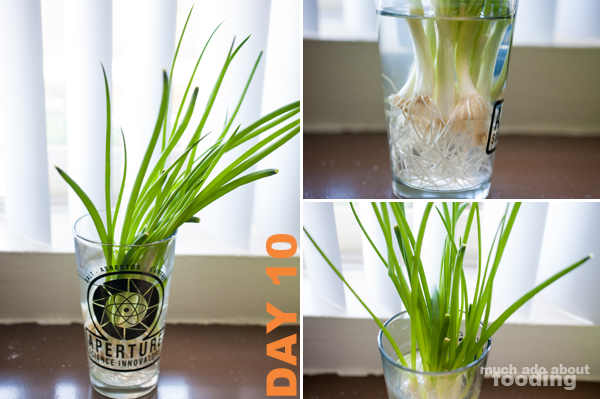 Slice off the green portion of an existing green onion bulb, leaving 1-2 inches of white. Peel off any dying layers of onion. If the roots are too long already, snip them to about 1/2 inch to 1 inch in length. Fill a jar or glass with clean room temperature water. Place bulb in container by a sunny window. Replace water every 2-3 days. 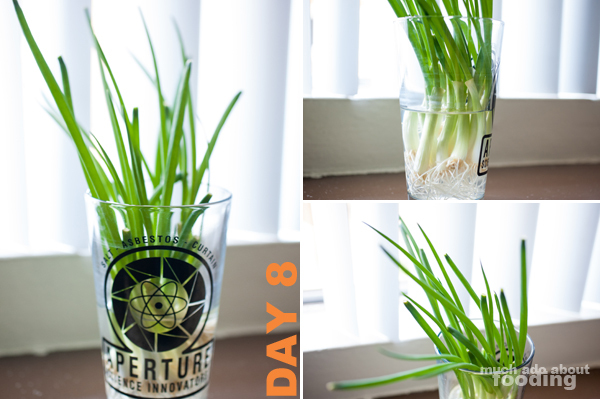 We tried to take pictures of the progress at the same time every single day so you can see the stages of growth. At one point, they got so tall that vertical photographs didn't make sense anymore. As you can probably see, the roots get quite long and really thrive off of the water. Other vegetables this is said to work with are lettuces and celery but that should be for another post some day! I loved how the green parts just reached towards the sun wherever it came, seeking the warmth and nutritious rays. 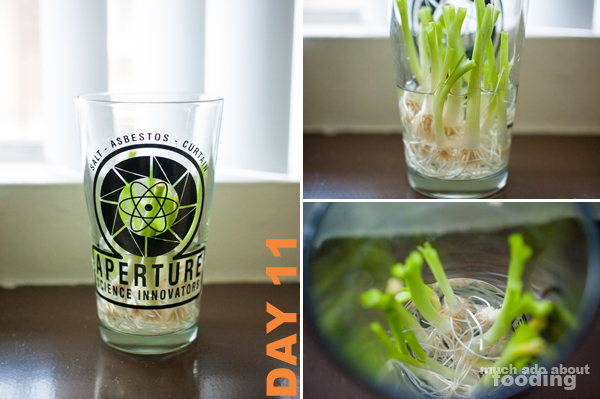 I eventually harvested on Day 10 because Duc was getting annoyed at how much green onion was taking up the window space, hah. 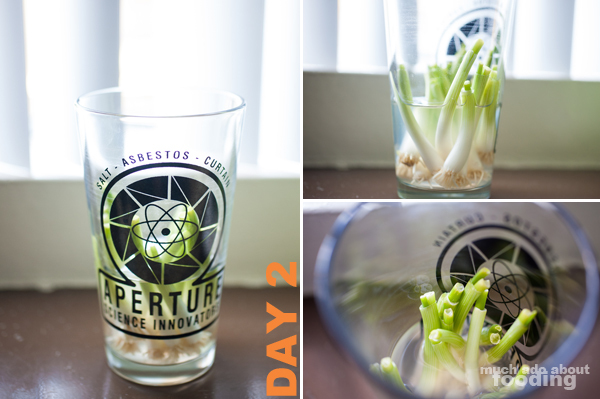 Of course, harvesting just meant that I would restart the experiment because shoot, you can do this several times! 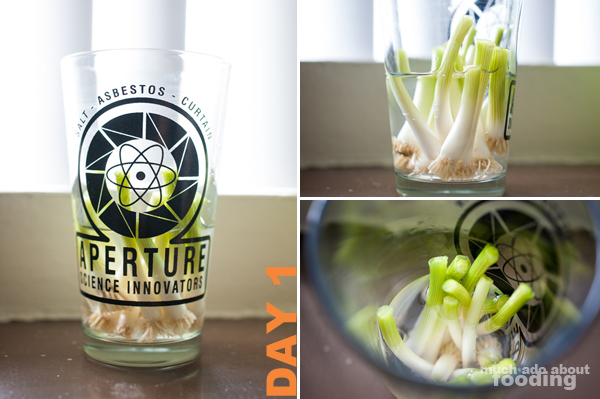 As for the taste, since these aren't growing in dirt, eventually the flavor will diffuse but I'd say each bulb is good for about 3-4 regrowths before they started tasting hollow. Don't forget to change out the water of course. 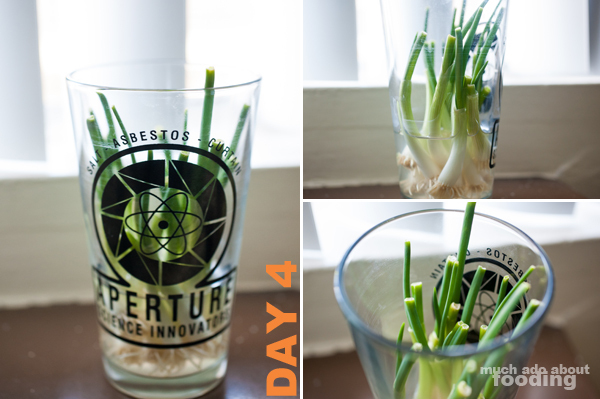 It needs fresh supplies every 2-3 days! Easy peasy, right? Try your hand at it and let me know how it goes.